Sorry... the 2017 Honda Fit is no longer being sold as new. Instead, take the first step to a great deal on 2019 Honda Fit with a free price quote! 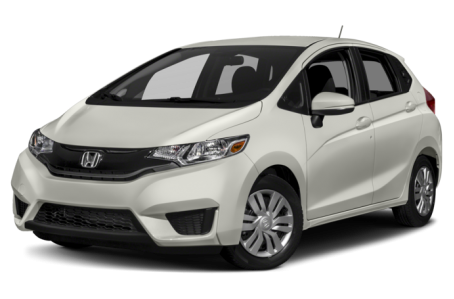 The 2017 Honda Fit is a compact 5-door hatchback that has impressive cargo capacity for its diminutive size. It competes with the Mazda3, Kia Forte, and Ford Focus. This year, it remains largely unchanged. Three trim levels are available: LX, EX, and EX-L. The styling changes introduced in 2015 make the Fit more aggressive, with sharp angles and creases that run down both sides of the hatchback. In some ways, it looks like a smaller version of a minivan – sans the sliding doors. The redesign also made the Fit more aerodynamic, which helps fuel economy. A body colored spoiler comes standard, as do 16-inch wheels and automatic headlights. Heated side mirrors, fog lights, and a power moonroof are also available. Under the hood, the Fit features one of Honda’s Earth Dreams engines, a 130-hp, 1.5-liter four-cylinder is mated to a six-speed manual or a CVT. The CVT is optional on the LX and EX models, but comes standard on the EX-L. With the manual, the Fit gets 29/37 mpg city/highway, while the CVT returns an even higher 32/38 mpg. For the best fuel economy, opt for the LX with the CVT; it takes out some weight, adds underbody covering for improved aerodynamics and gets 33/41 mpg, which is best in class. The Honda Fit has one of the most aptly descriptive names of any car around offering plenty of passenger and cargo volume, even rivaling some small SUVs. While the new Fit is shorter in overall length, the wheelbase has been lengthened and slightly widened which means even more passenger volume, especially when it comes to rear legroom which grows by almost five inches. Some of the new passenger room comes at the expense of rear cargo room, but the Fit still has its second-row “Magic Seat” for great flexibility. The second-row seat cushions can fold up, which gives plenty of space to store taller items, and with the second-row folded flat into the floor total cargo area is 52.7 cubic feet which is again, class leading (it more than doubles the Fiesta). There is also plenty of new standard equipment as well, keeping with a trend of putting more and more features into smaller cars. Bluetooth connectivity and a backup camera are now standard, joining a 5-inch LCD screen, USB port, and air conditioning. Upgrading to the EX trim adds even more features, including push button start, a 7-inch touchscreen, HondaLink, and Pandora internet radio. For the first time, leather upholstery is optional, as is HD radio, a navigation system, and heated front seats. 47 of 47 (100%) consumers said they would recommend this vehicle to a friend.